In 1978, the Walmajarri people took over the lease of Billiluna and Lake Gregory (Mulan) stations from the Federal Government. The area was initially tribal lands of the Walmajarri people. Upon receiving the land, the people asked for the facilities needed to run their communities. Such facilities included a school. After consultation with both the Government and Catholic Education systems, the communities decided they would like a Catholic school to be established in each community of Billiluna and Mulan. Accordingly, in 1978, the Bishop of Broome along with community members, requested the Sisters of Mercy in Singleton NSW to send sisters so that schools could be opened. The communities wanted their children to learn about God, read and write and do number work, so that eventually the community could run its own affairs and live successfully, in both the Aboriginal and non-Aboriginal world. In late January of 1979, two sisters arrived to begin the schools. On 5 February, 1979, Sr Bernadette Mills commenced school at Billiluna station with approximately 40 children, covering all primary grades. 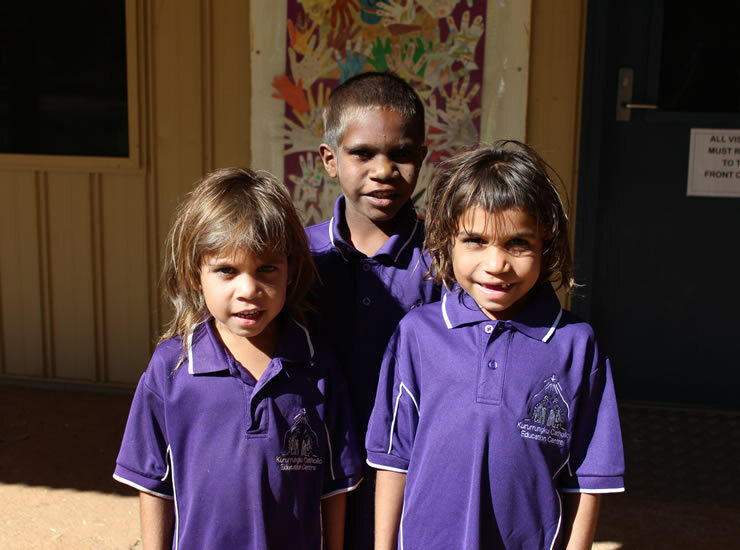 Originally, it was planned to send the older students to Balgo and attend high school there, however, the community decided against it, as it had no close ties with the Balgo community, and wanted their children to stay in Billiluna. The first classroom was a tin shed with a concrete floor and corrugated iron walls – originally used by stockman as living quarters. In 1981 a new building was erected on an areas chosen by the community. In the years 1987 to 1990 three more teaching spaces were built as well as a library and an office. In 1990 the secondary component of the school was undertaken, rather than the secondary student travelling to Balgo each week for high school. 1992 saw the first intake of secondary students. The Sisters of Mercy were a presence in the school for many years to come. Staffing at the school stayed as two Mercy sisters until 1989 when one sister was to leave. The remaining sister was joined by the first permanent lay teacher. Since then the staff have grown, including Aboriginal Teaching Assistants. Over the years there has been many community members assist the children in learning, by coming in to the school to teach the children the culture. Kururrungku has also been served by many other professional resource people who visit the school regularly to assist the students. Kururrungku Catholic Education Centre’s logo depicts the Holy Spirit coming down on wallabies. Wallabies are the dreaming lore for the Walmajarri people of Billiluna Station. Long time ago in the Dreamtime, a lot of people were travelling from Sturt Creek. They travelled all the way to Mayarra. The snake became tired, it coiled itself around the tree then went into the waterhole and stayed there. One female and one male wallaby were travelling to Mayarra. They were called kururrungku. The skin names were Napurrula and Jupurrula. The female Napurrula was tired and stopped there. All the people kept walking and asked her to keep going. She refused and said “I am tired, weak.” She sat down. The male wallaby, Jupurrula, kept walking. He looked back, saw his sister stopped, so he stopped too. The two kururrngku stayed by the gum tree. This is the Dreaming law for us. Kururrungku Catholic Education Centre is a Catholic learning environment catering for students in Pre-Kindy to Year 10. It is situated on Billiluna Station, 180km south east of Halls Creek on the Tanami Road and joins the Canning Stock route at its juncture. The school serves all students residing at Billiluna Station. Long time ago in the dreamtime, a lot of people were travelling from Sturt Creek. They travelled all the way to Mayarra. The snake became tired, it coiled itself around the tree and then went into the waterhole and stayed there. One female and one male wallaby were travelling to Mayarra. They were called ‘Kururrungku’. Their skin names were Napurrula and Jupurrula. The female, Napurrula was tired and stopped there. All the people kept walking and asking her to keep going. She refused and said, “I am tired, weak”. She sat down. The male wallaby, Jupurrula, kept walking. He looked back, saw his sister stopped, so he stopped too. The two Kururrungku stayed by the gum tree. This is the Dreamtime lore for us.